Speedstar 2500 - AK Drilling, Inc.
At AK Drilling we utilize a Speedstar 2500. 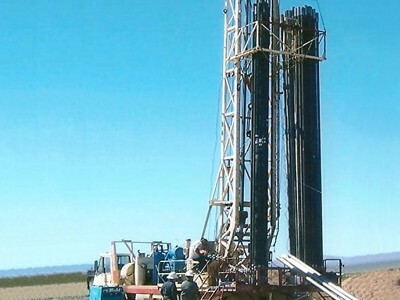 This drill is known as a workhorse in the water well industry for its reliability, durability and ease of operation. The Speedstar enables our crews to quickly and efficiently deploy, set up and drill water wells for our clients. At AK Drilling, we have invested in a fleet of drill rigs that represent the newest technology in the industry. We have designed an innovative maintenance program to ensure all of our drill rigs and support vehicles are continually on the job, getting our clients projects done, safely, on time and on budget. Our long track record of success has inspired our client's confidence in our equipment, our experience and our focus on safety. Our equipment is deployed in many locations around North and South America, ready to meet our client's project needs. We have the equipment and trained personnel standing by to perform helicopter delivery and set up of drill rigs in remote locations. We specialize in hard to reach project locations with our fleet mineral exploration rigs that feature minimal ground disturbance and the ability to reach sites in the most rugged terrain. The Gyro is a complete down hole surveying instrument for logging and mapping of drilled holes. Call Jim For Survey Services at 406-498-6262 Directional survey inside the following drill rods: • Reverse circulation • Conventional diamond core drilling • Wireline drilling • Raise bore • Percussion • Rotary • Directional drilling • Steered coredrilling Providing directional data (azimuth and dip) at an interval of 10m from inside the drill string. At AK Drilling we use the amazingly capable Foremost Discoverer MPD 1500 Reverse Circulation drill rig for challenging mineral exploration projects. This powerful rig utilizes the reverse circulation technology and a hydrostatic track system to minimize environmental impact and maximize access in rugged terrain. The Foremost Discoverer MPD 1500 enables AK Drilling to provide a reliable, efficient, go any where solution for your technical exploration projects. AK Drilling utilizes a versatile Foremost Explorer 1500 Reverse Circulation drill rig for many mineral exploration projects. This powerful rig uses the reliable reverse circulation technology. The high flotation terra tires and unique chasis design minimize environmental impact and maximize access in rugged terrain. The Foremost Explorer 1500 is an reliable and cost effective resource AK Drilling provides for our customers. For easy positioning along bench walls and open-pit side wall mine applications, AK Drilling uses the Foremost Prospector W750 Reverse Circulation drill rig. This versatile rig excels in the most challenging mineral exploration projects where a pivoting mast is the only way to get the samples you need. It utilizes the powerful reverse circulation technology and is equipped with high flotation terra tires to minimize environmental impact and maximize access in rugged terrain. AK Drilling we utilize several LF-90Ds for surface core drilling projects. These powerful and reliable core rigs are designed to be highly mobile. The unique design of these rigs allow our skilled crews to deploy these rigs to sites using tracked or wheeled platforms. AK Drilling makes effective use of the Boart Longyear LF-70. These portable, small-format drills are ideal for remote locations where deploying helicopter portable equipment is the only practical or the most efficient option. The Boart Longyear LF70 allows AK Drilling to provide their customers unparalleled mobility and access with advanced drilling capabilities for technical exploration projects. At AK Drilling we utilize several LF-90Ds for surface core drilling projects. These powerful and reliable core rigs are designed to be highly mobile. The unique design of these rigs allow our skilled crews to deploy these rigs to sites using tracked or wheeled platforms. At AK Drilling we have several Morooka Rubber Tracked Carriers equipped with a variety of drill rigs and support equipment for applications in intimidating or sensitive terrain. Morookas are high performance vehicles with advanced track technology giving AK Drilling the ability to go anywhere with very little ground disturbance. AK Drilling maintains several support vehicles, easily configured as water carriers or cranes, ready to support any job. Our inovative maintenance program and high equipment standards keep our drill rigs and support equipment on the job getting your project done. AK Drilling has several Foremost Dual Rotary rigs that can be mobilized throughout North and South America. The dual rotary technology is ideal for applications in unconsolidated formations with difficult sand, gravel, cobbles and boulders. The Foremost Dual Rotary D-12 rig enables AK Drilling to quickly deploy highly cost effective equipment to projects where ever they may be to keep our clients on schedule and in budget. 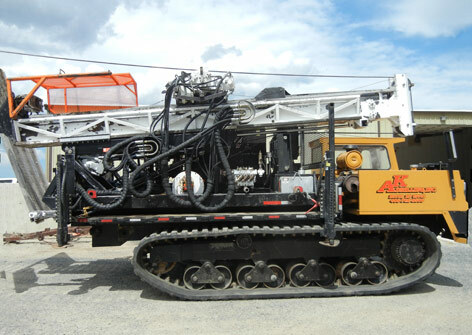 AK Drilling has several Foremost Dual Rotary rigs that can be mobilized throughout North and South America. The dual rotary technology is ideal for applications in unconsolidated formations with difficult sand, gravel, cobbles and boulders. The Foremost Dual Rotary D-24 rigs enable AK Drilling to quickly deploy highly cost effective equipment to projects where ever they may be to keep our clients on schedule and in budget.